Stanley's Retro Collection of steel doors is definitely style-driven. These doors' retro style is both classic and current, while their performance is at a level that only a Stanley Door could provide. Their enhanced door lite frame adds an Art Deco appeal and further lends to their retro feel. Inspired by the great Architectural traditions of the 20th century, this series offers you a classic look for your home's entrance. Actual colours and appearance may vary slightly from image due to lighting. Stanley Doors helps you create an entrance that is an extension of your unique personality. Our products offer lasting, elegant entryways with an emphasis on style, security and, energy efficiency. ENERGY STAR certified and double bored, the door can accept a lock and deadbolt of your choice. Inspired by the great Architectural traditions of the 20th century, this Architectural series offers you a classic look for your home's entrance. In addition to the beauty of our doors, you could be sure that once installed, they are simple to maintain and care for and are backed by Stanley's limited lifetime warranty to boot! 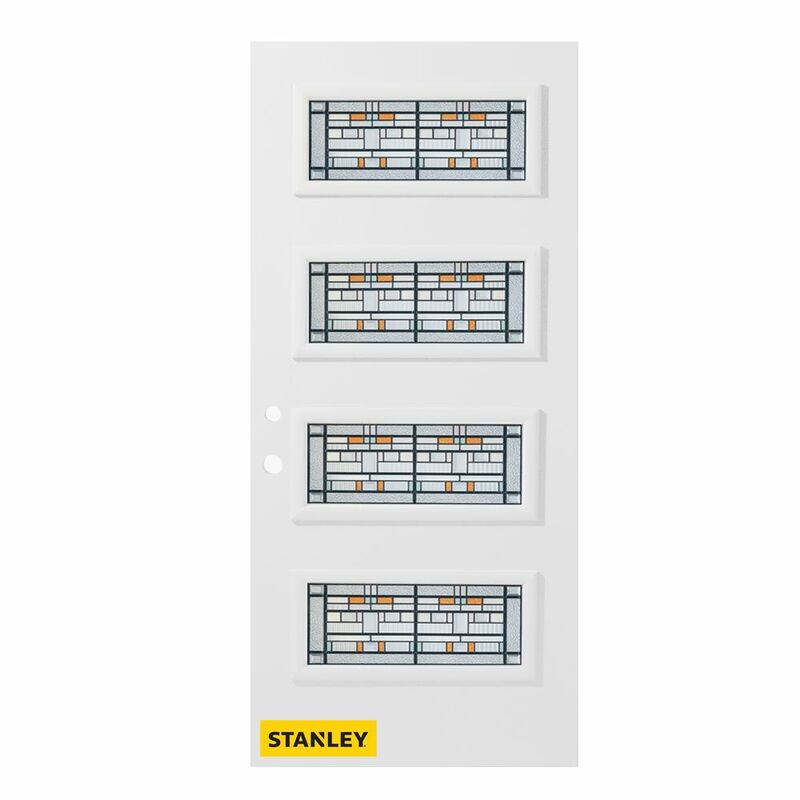 Stanley doors is dedicated to manufacturing the highest value products. We are continuously developing and innovating products that will serve you for many years. Welcome home. Stanleys Chicago decorative glass in a 3/4 lite brings 1920s style art deco elegance to your home in a durable 1-panel steel pre-hung entry door that provides protection from the elements with a polyurethane core. ENERGY STAR certified, the 36 in x 80 unit comes double bored to accept a lock- set and deadbolt of your choice. PLEASE ALLOW 2-3 WEEKS FOR DELIVERY AS THE DOOR IS CUSTOM MADE. 37.375 inch x 82.375 inch Chicago Patina 4-Lite Flutelite Prefinished White Right-Hand Inswing Steel Prehung Front Door - ENERGY STAR® Stanley's Retro Collection of steel doors is definitely style-driven. These doors' retro style is both classic and current, while their performance is at a level that only a Stanley Door could provide. Their enhanced door lite frame adds an Art Deco appeal and further lends to their retro feel. Inspired by the great Architectural traditions of the 20th century, this series offers you a classic look for your home's entrance. Actual colours and appearance may vary slightly from image due to lighting.